Kindergarten children are much more social beings than they were at the start of Montessori pre-primary. They enjoy working collaboratively and sharing their discoveries with each other. The kindergarten sessions are vibrant in activity and children often like to work in small groups. 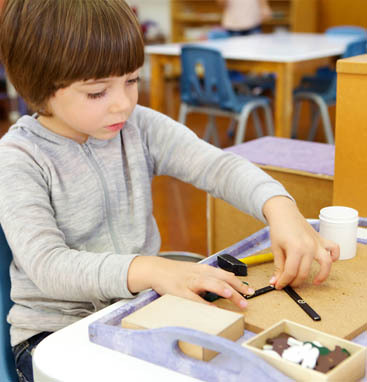 Following on from their early experiences the kindergarten children continue to use Montessori materials to develop their academic skills and knowledge. The materials now help them to move from concrete concepts towards the abstract. The classroom environment and specific Montessori learning materials support each child to meet their individual developmental needs for academic growth, self-confidence and independent thinking and learning. The multi-age groups foster positive role modelling and support all children in their journey to independence. This final year of the 3-6 class is the time for kindergarten children to be positive role models for the younger children. It is a real opportunity for them to experience what it is to be a leader and practice these important skills. Supporting other children’s learning helps to support their own learning as only through teaching something do they really begin to understand the concept.